Karl Rove, the former head of a public affairs firm, is 56 years old. I, the head of a public affairs firm, am 56 years old. I am trying to imagine returning to my desk this morning -- not after a weekend with the family, but after the better part of a decade campaigning for, then running policy for, the president of the United States. 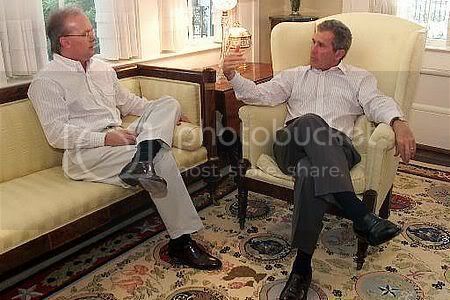 Should Karl Rove sit down at his old desk and take up with his old clients, he would certainly feel blessed relief. No matter how urgent, significant and life-and-death their problems seem to them to be, they would be dandelion fluff compared to what he has been dealing with. And no matter how he decides to manage a particular issue, the chances are pretty slim that he'd ever again be hung or burned in effigy, or investigated by a federal prosecutor, or vilified by the Dem leadership on the evening news. But I doubt if Rove will be able to focus on such projects again because they would seem rather irrelevant and simplistic after what he's been through. And I don't think any of the 2008 presidential campaigns will come calling, except perhaps for Hillary. She is, in Rove's words, just "tough, tenacious, fatally flawed" enough to do such a thing. So, I imagine, Rove's days will be filled with deciding which book deal to sign and juggling his calendar for big-ticket speaking engagements. The networks will come calling, asking him to be one of their political commentators, and who knows, maybe he'll start a blog. Whatever it is, it won't be managing the president. And that, I think, is not a bad thing. Rove is obviously brilliant and dedicated ... but let's count the domestic policy successes he can tuck away in his resume. There was the 2004 re-election. No, that's not a policy success. No Child Left Behind. That was pretty good. Two Supreme Court justices. Excellent, excellent. But far too many federal court judge nominations are still going nowhere. Avoiding, thus far, the wholesale selling out of the US to join the Warmie crazies. Getting and tenaciously holding on to the tax cuts. And now I'm beginning to grasp at air. Rove, for all the hatred he attracted from the Left, really didn't do that much because this was necessarily a foreign policy presidency. On the domestic front, runaway spending and failure to deal toughly with the border will be a big part of Rove's legacy. But he can be satisfied nonetheless, knowing that anyone who can make the crazy, paranoid, hateful crazies of the Left as apoplectic as he did must have been doing something right. Unfortunately, Rove is not destined to just leave the White House so my musings have been a bit of fantasy. The Dems have investigations brewing and now that he's not shielded by the president's executive privilege anymore, I imagine that the "family time" he's supposedly pursuing is going to be replaced with a lot of "lawyer time." What other choice do the Dems have? They know that Rove helped solidify their base even more than he solidified the GOP base. They can't' afford to let him ride off into the sunset. Can There Be Justice For These Murders?